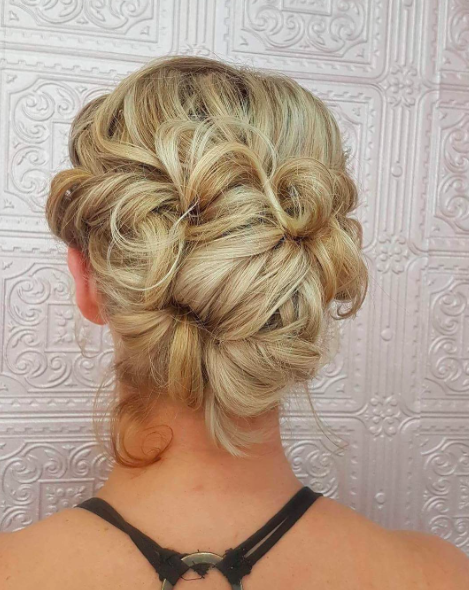 Long hair is great for when you want to play around with intricate and beautiful updos, giving you plenty of hair to twist, braid, twirl, pin, and play around with. Although shorter hair is understandably easier to manage, there are plenty of benefits to having longer, luscious locks. 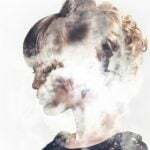 The first being the kind of styles that you can achieve with them, and the second being that, when you don’t want to have your hair long and loose, you can easily and quickly tie everything back so that it is out the way. 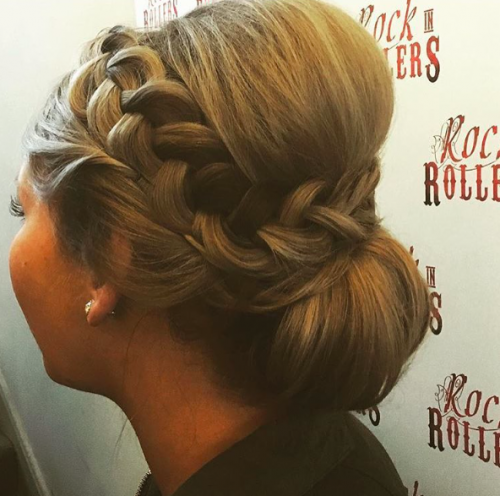 If you’re on the lookout for a romantic updo to wear your long hair, this might just be one that ticks all the right boxes for you. It’s loose and pulled-apart, making it perfectly casual, but at the same time, there is something incredibly elegant about it. It could easily be worn for a more formal affair too. Twist it and turn it and pin it right where you want it for a look that Lady Gaga would be proud of. This isn’t Lady Gaga, of course, but she looks just as amazing. In fact, despite being actually quite simple, this look is one that has been chosen by a number of celebs over the years. 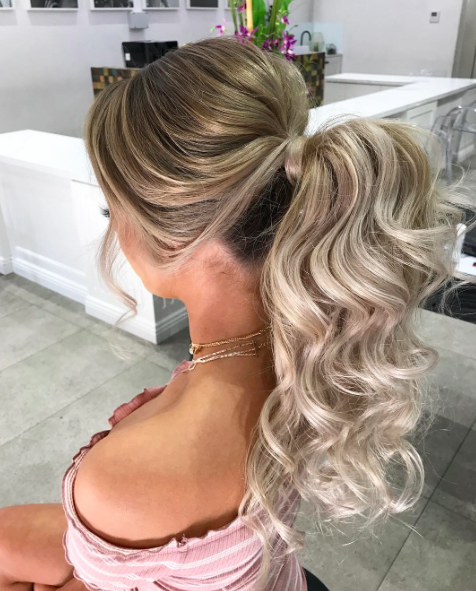 Of course, you could always keep things nice and simple, wearing your long hair in a high bun and then finishing everything off with a super cute bow. It’s retro, adorable, and we love it, but what are your opinions? Don’t forget to leave your comments in the box below. If you head on over to the App store on your Apple iPhone, you’ll be able to find a clever application called “Confessions of a Hairstylist”. You’ll find plenty of hair inspiration, including this wonderful touseled looped faux hawk, It’s big and bold, but still feminine enough to match any glam occasion. 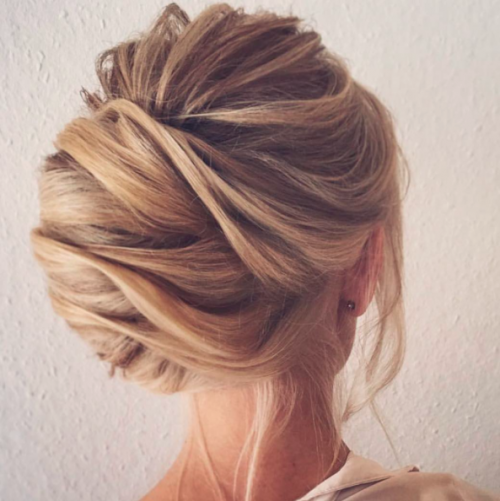 For those days when you need to look glam but time is definitely not on your side, how about updos for long hair like this one? It’s definitely elegant, and easily done when you have the right know-how. This is simple. 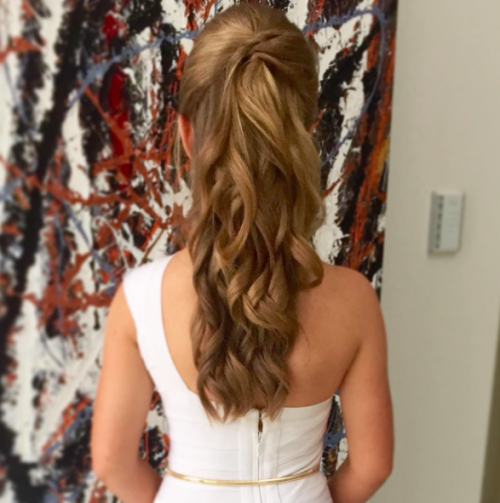 Start with a ponytail and then pull out your hair to give it some volume at the crown. Spin the ponytail around into a high bun, and then twist and pull that out too. A few pins will keep everything in place, and a quick spritz of hairspray will give you a second level of security. 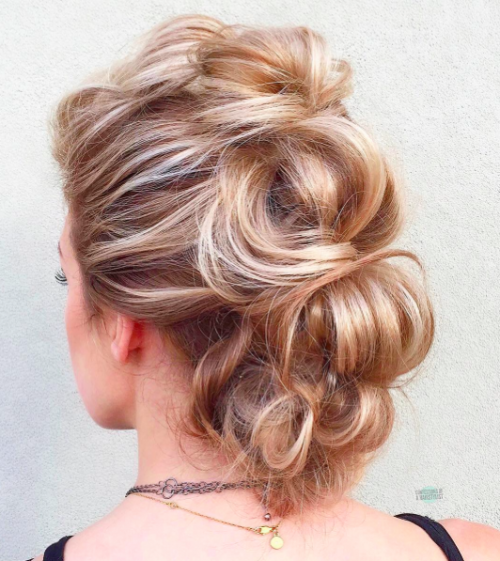 We’re taking things down slightly lower now, to this adorable messy chic low bun. Despite being messy, it’s still a very elegant look, and that’s the thing you’ll need to get into your mind. It doesn’t need to be perfect in order to look perfect. Sometimes, it’s the little imperfections in your style that makes it what it is. Don’t be too scared to play around. You can always take it out and start again if you don’t like what you’ve created. 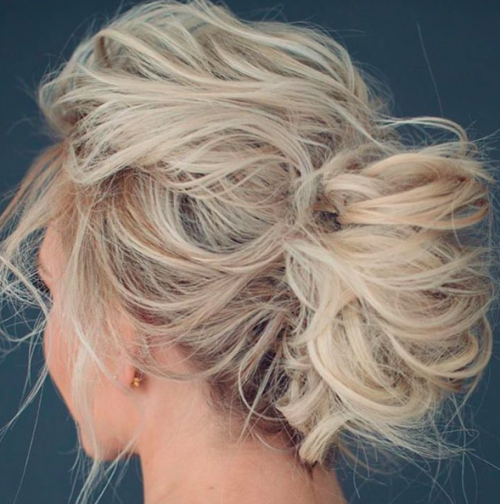 The thing you need to remember about these updos for long hair is that you can always just tear them down and start things all over again if you don’t like what’s coming together. Practice often makes perfect, especially when you’re learning something new. Keep practicing your updos, on yourself and on friends with longer hair (if they’ll let you) until you’re more confident with what your fingers can achieve. 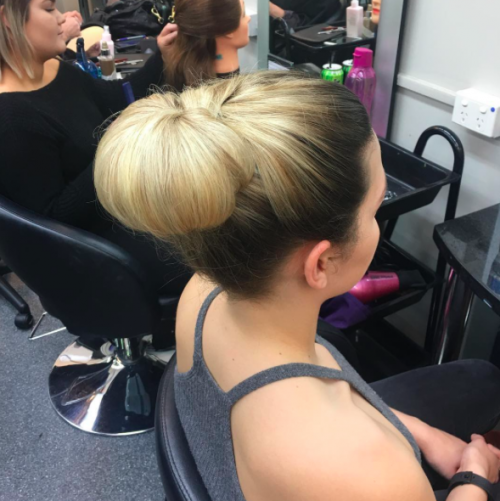 If you want things to be super sleek and super chic, just like this ballerina bun, you’ll need to get yourself a small baby toothbrush, or a small, soft-bristled brush of some description. Use this, lightly sprayed with some hairspray, to get rid of those fine baby hairs that always stick up in all sorts of directions. It’ll keep them flat and sleek for the rest of the day. We’ve tried it! 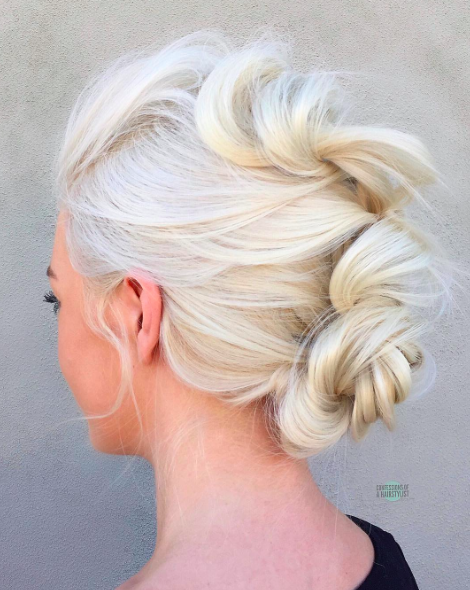 Don’t be afraid to think outside the box when it comes to your updos for long hair. Add your jewelry, just like this pearl necklace, or pin in earrings for something that really will stand out. We loved this classic look a lot. How about you? Ringlets are cute and cool, although we don’t think they’re given enough love these days. This one looks fabulous all pinned up like that. That’s what we think anyway. But what did you think? It’s brilliant and bold, and very cleverly done if you were to ask for our opinion. You’ll be amazed by what you might come up with when you start twisting and twirling your hair, before pinning it in place. But does this one tick all the right boxes for you? Throw things up into a tight and sleek bun, and then pull it apart again. Why? Because you’ll end up with a pretty cute look like this one when you do. It’s cute, right? You could even add ribbons and bows, plus a wide range of other hair accessories if you wanted to make it fit right in for a particular event or occasion. Add some volume to the roots with backcombing and dry shampoo, and then keep a bit of your pony to wrap around the base to achieve this fabulous look. 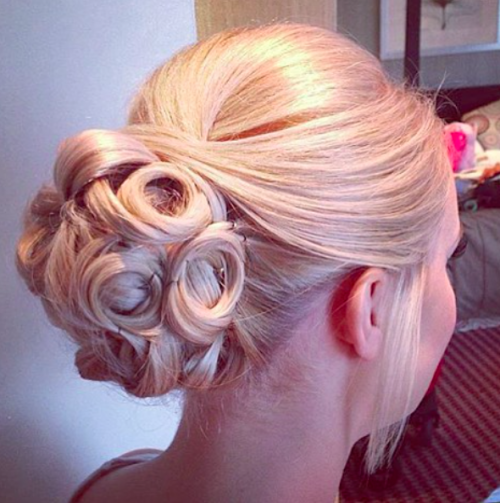 The ponytail, although often overlooked, is the great place to start with any updo. You can achieve a wide range of looks from that one base. 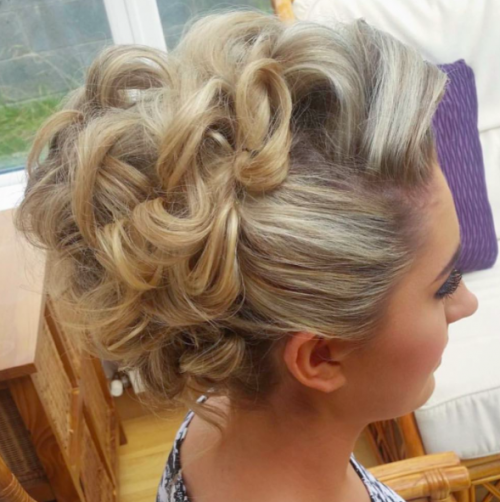 Pin curls are another trendy look right now, often fifties-inspired. They’re adorable if you ask us, and you could even add a little something extra with hair chalks and temporary colors, adding some real bright tones into the mix. 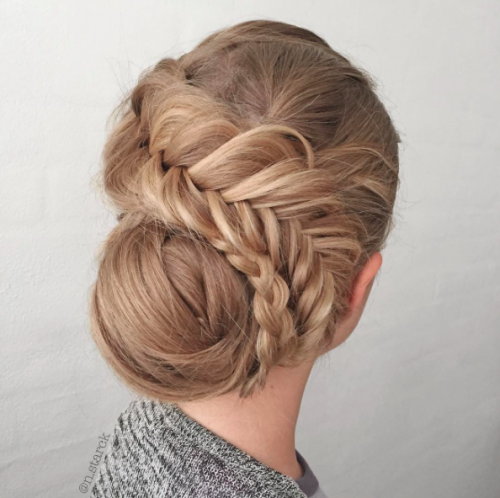 Opt for a messy, low bun, and then add some fishtail braids to the mix, and what do you have? This, obviously. Cute, simple, refreshing. But will this one flat your boat? Or sink, depressingly? Either way, we want to know. Leave your comments in the box, you know what to do! 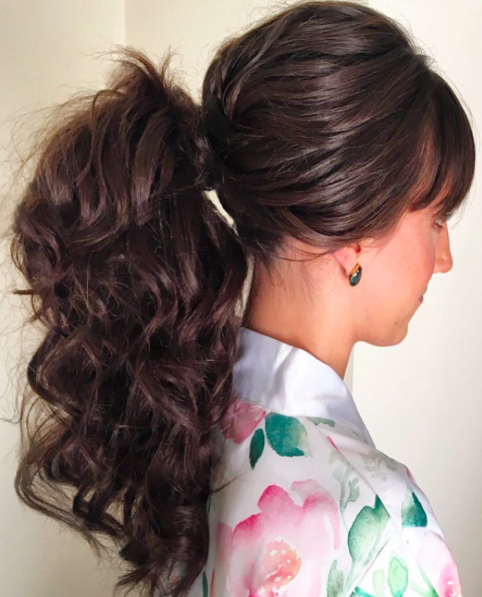 Do you know someone who would look amazing with this long updo? Share it with them! You know they’ll love you for it. 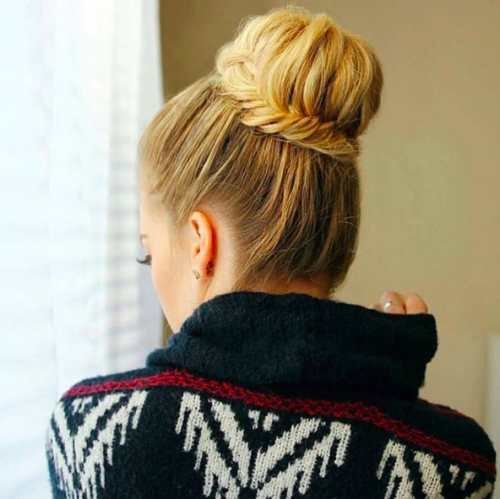 Combine a ballerina bun in all its chicness, and then add a braid, and you have this cute look. It’s simple yet effective and definitely packs high impact. Another look that suits a variety of events and occasions, this pretty and twisted look could just as easily be worn with jeans and a t-shirt as it could a bridesmaid dress on someone else’s big day. 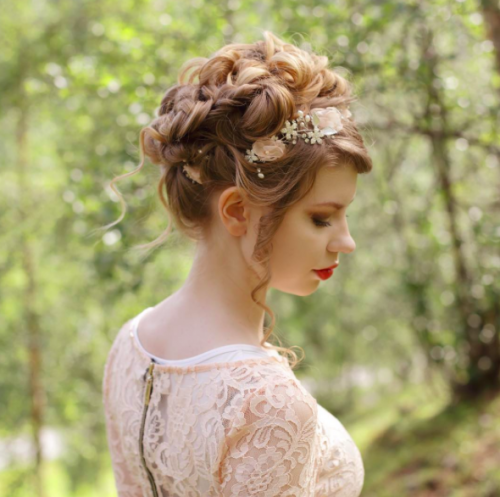 In fact, we also think this cute updo for long hair would also make great hair for a bride too, but what do you think? 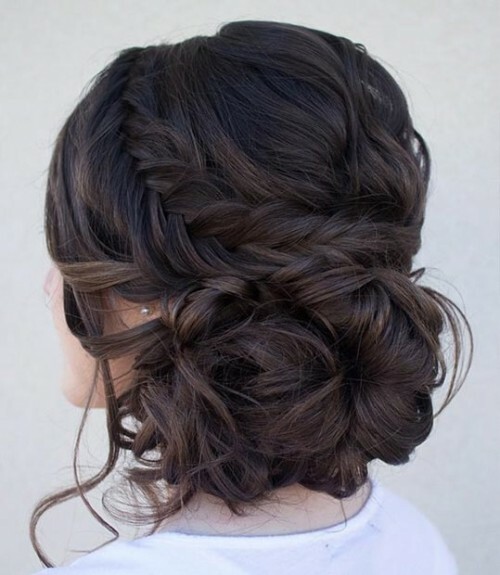 Throw twists, curls, and braids together and you’ll have a design that looks a little like this one. It’s certainly cute, and could even be accessorized in a whole variety of ways. If you combine braid styles, you could create something that looks a great deal more complicated than it actually is. 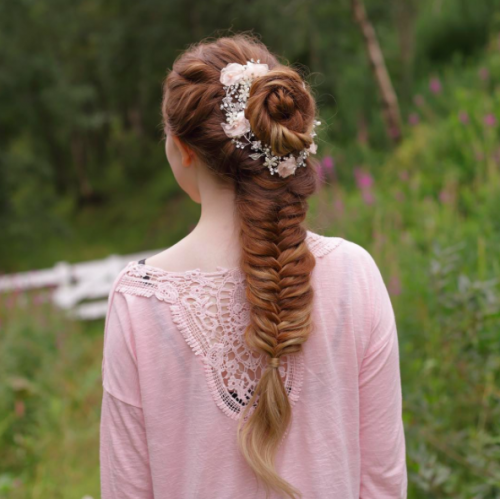 Once you learn how to French, Dutch and fishtail braid — the braids that you can see here — you can create a wide variety of looks in virtually no time at all. They’re a lot easier than you’d think too. Use hair accessories, such as a headband, to add something really cool, cute or romantic to your look. Worn without the band, this could easily be a relatively chic but messy updo for the daytime. Add the headband and some glossy red lips, and you have a nighttime look that anyone would be envious of. Looks like this are great for when you want something you can easily throwback, but without lots of twisting and pinning necessary. 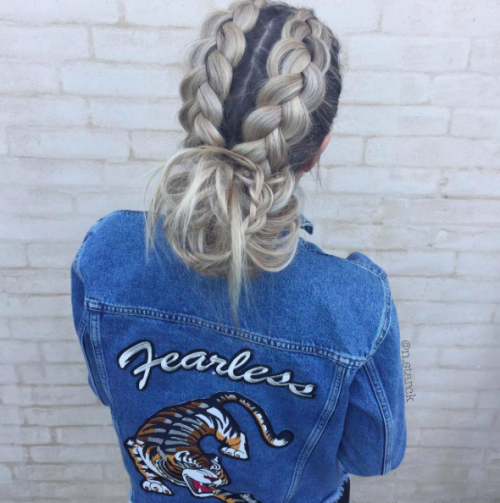 Braids are very easy and quick to do once you’ve learned the technique, and there are so many styles to choose from too. 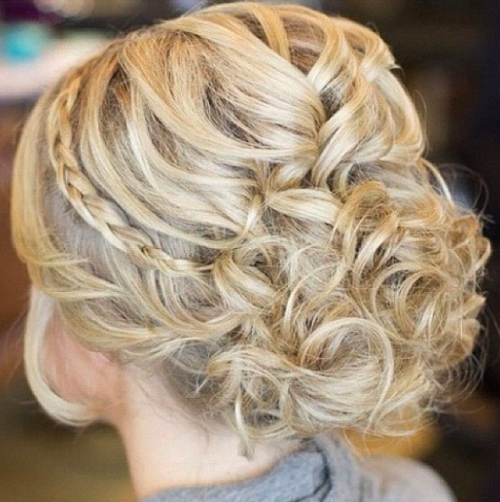 If you’re a queen who’s missing her crown, how about this pretty updo? 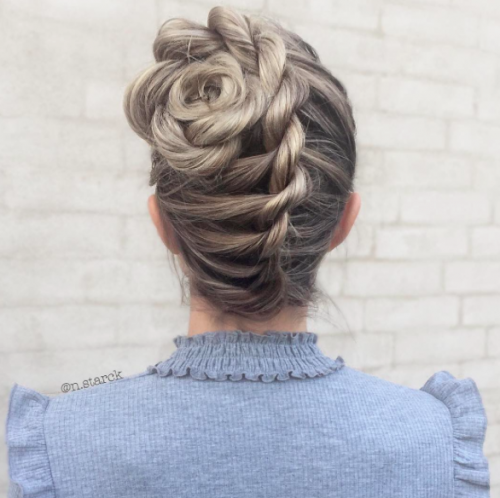 Clever twists to regular French braids make this hairstyle what it is, elegantly twisted together at the top for a messy braid that’s not so messy at all. Here’s a great tip or you if you have long hair and like to let it dry naturally … Leaving it to dry naturally *without* product is what leaves you with that frizz-ball you can’t do anything with. Try leaving it to dry after using creamy-style and based products that add something to weigh the hair down, but not too much. It’ll give you enough of something to work with when you want to recreate a style like this and then keep it in place for the entire day, night, or both. 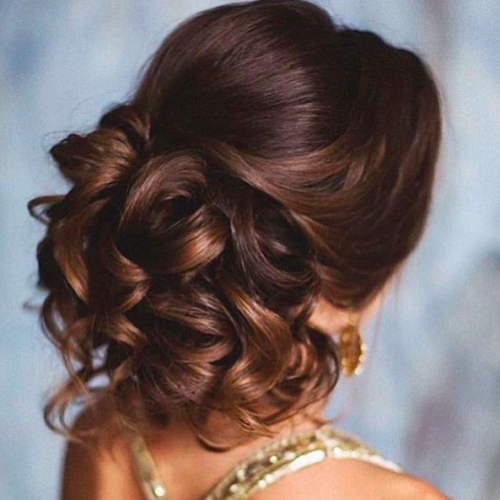 Updos for long hair like this one give you a way to take some really good care of your hair. Wash your hair, let it dry naturally, and then style it into a look like this, that doesn’t actually require too much in the form of curling and product-dripping. You can leave the blowdryer behind, a tool that is well known to dry your hair out, especially if you use it very regularly. 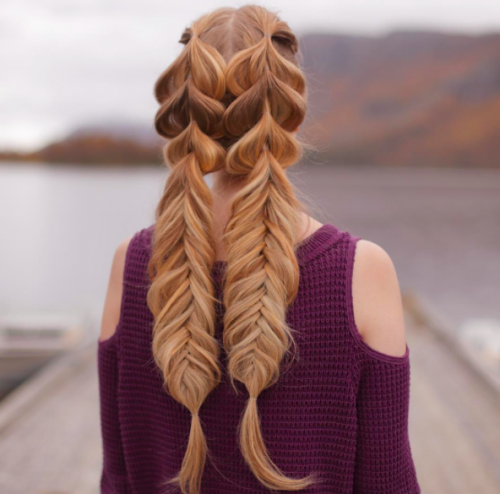 Take a very simple hairstyle, such as pigtails, and then add a new twist to it, such as adding a braid. And then, when you think you’re done adding new stuff to older looks, pull it apart. Look what happens when you get creative and think outside the box. This look is both brilliant and beautiful in equal measures. Fishtail braids, working with 4 strands, look great when they are ever-so-slightly tugged apart. You don’t want a neat finish when you’re opting for something waved and relaxed, like this look. Add a floral twist to any braided look for an instant feminine finish. This look would have been cute enough as it was without the floral addition, but that garland really does add something super cute and pretty into the clever, braided combination. 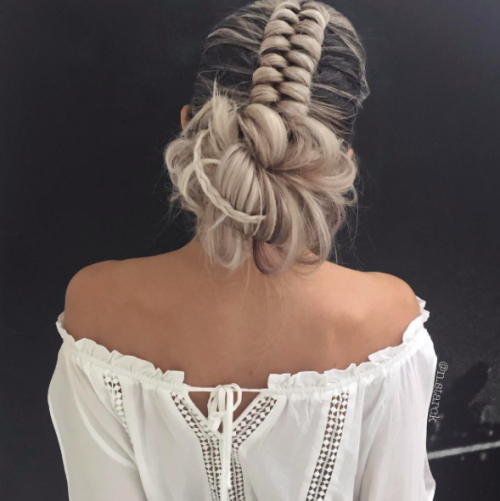 The rope braid is another modern and new style of braid that everyone seems to be obsessed with right now, and when you take a peek at this cool look, it’s no wonder. 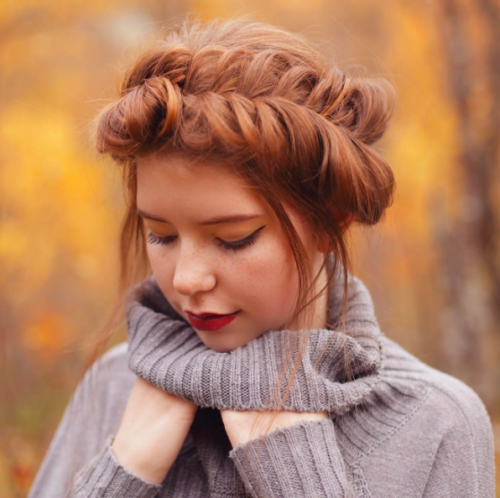 Slightly different than regular French, fishtail, and Dutch-style braids, everyone will be asking questions about it, before they ask you to recreate it on their hair too. Look for hair masks that contain both olive oil and avocado oil if you want to give your long locks a good boost of nutrients and hydration. As well as promising to restore some serious shine back into your locks, the blend of oils will also leave your hair softer and healthier. If you’re a big fan of regularly styling your locks, you should use a mask that contains these products to try and undo some of the damage. 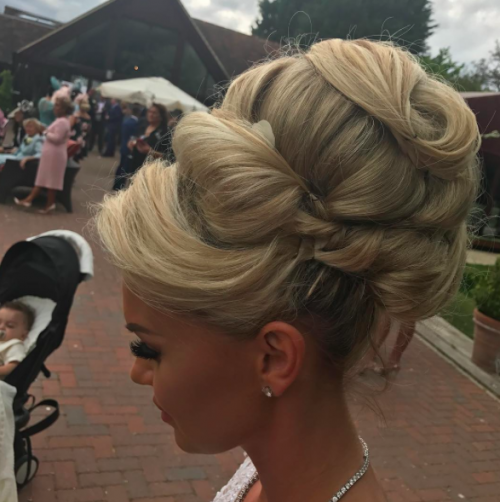 Taking things back to basics with a look that is both elegant and glamorous is a very good idea, as shown by this big and bouffant look. 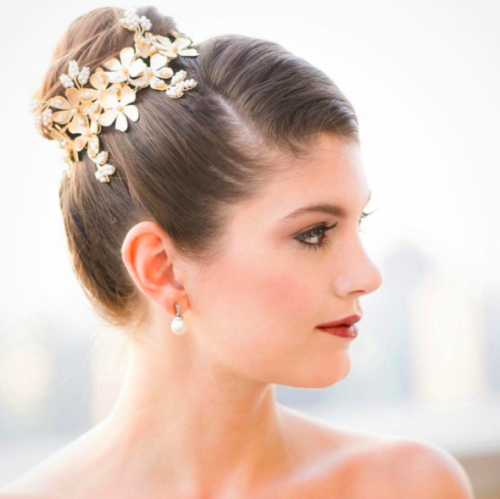 If you’ve got a beautiful tiara to set upon your head, this would be perfect for it. You wouldn’t believe how simple this look is. 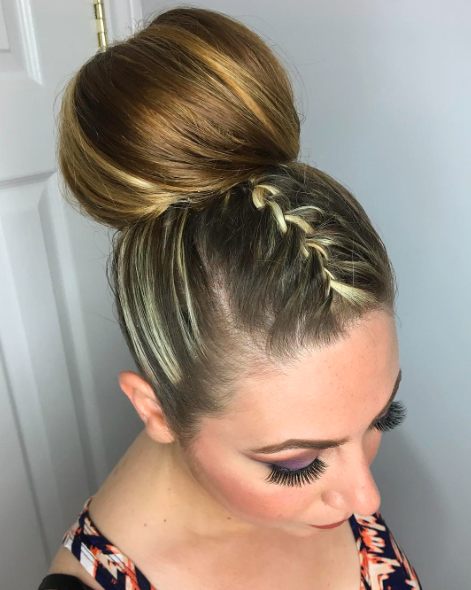 Make a bun with the center section, going back into the back section, of your hair, and then use the two side sections to spin around, hide any pins or bands, and finish the look. Simple, easy, and ready-to-go in five minutes flat. We love that. 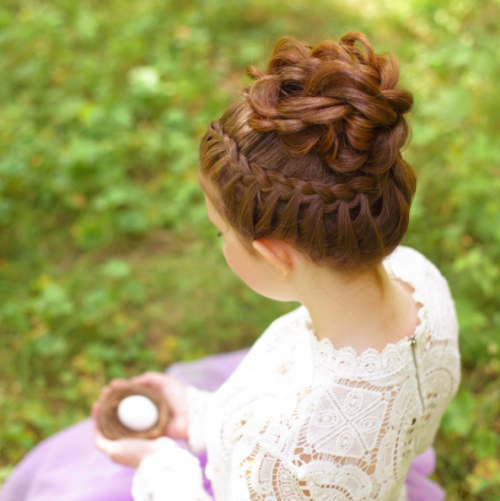 Going Dutch generally means taking things from top to bottom, or front to back, in terms of braiding. A Dutch-French braid is one that is folded under, rather than older, and that’s the same for fishtails too. Just one simple change to a very regular and everyday braid gives you an entirely new finishing look. Clever, right? 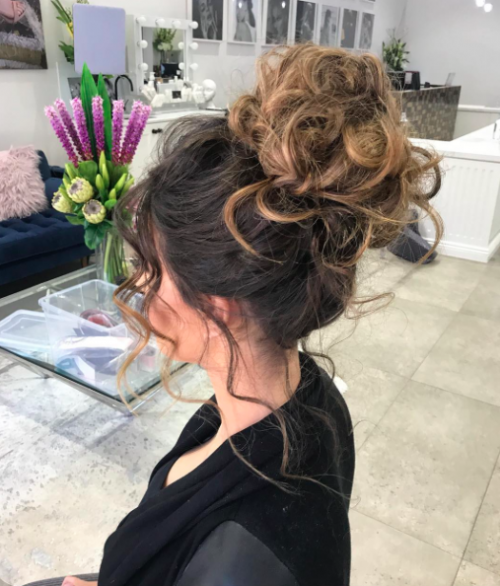 Of course, one of the benefits of updos for long hair like this one is that you can usually get a couple of day’s wear out of it, and maybe even a couple of different looks if you play your cards right. On day one, keep things nice and sleek and neat. On day two, pull things out slightly to give you a more relaxed and boho feel. On day three, let things loose and enjoy the crinkled waves that the braids give you. A quick spurt of dry shampoo will help any greasy-root problems. Take things bigger using a donut style hairpiece and you might end up with a day-at-the-races ready hairstyle like this one. 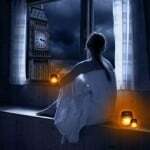 The more hair you have, and the more you backcomb it, the higher you can go. But … how high is too high exactly? 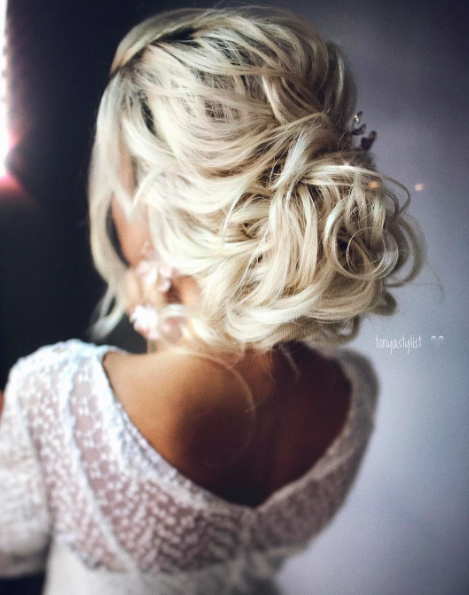 This updo for long hair is perfect for the blushing bride, especially if she wants to show off a beautiful backpiece on the dress, and the length of her hair, all at the same time. Well, kinda. It’s like the perfect compromise anyway. Add it to your Pinterest wedding board immediately. We’re going to. For when you want up hair, but down hair, all at the same time, we bring you this wonderful chocolate brown creation. Add some ringlets curls to your hair, tousle them around with your fingers, and then use a couple of grips to keep them slightly pinned back. Elegantly simple — lovely, right? If you were looking for a cool weekend inspiration look, this might be it. 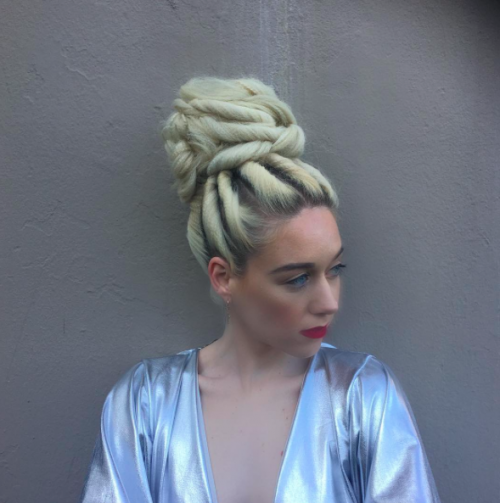 Not just the braiding in this look that took our breath away, the colors in her locks are really stunning! 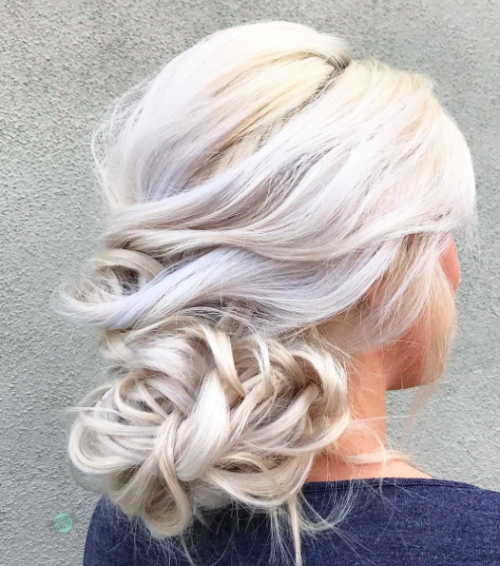 This beautiful French roll has been brought to life by those cleverly-placed highlights, although it doesn’t need that to be beautiful, of course. Sometimes all you really need to do with your hair is roll it. French roll it, that is. 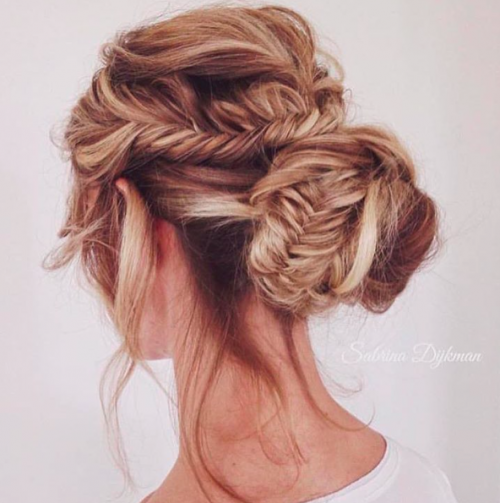 Add a simple French braid to a ballerina bun and you have a cute little look that also shows off your highlights too. It’s a clever way of showing off your hair even on the days when it’s so greasy or unwashed that you don’t really want to show it off at all. 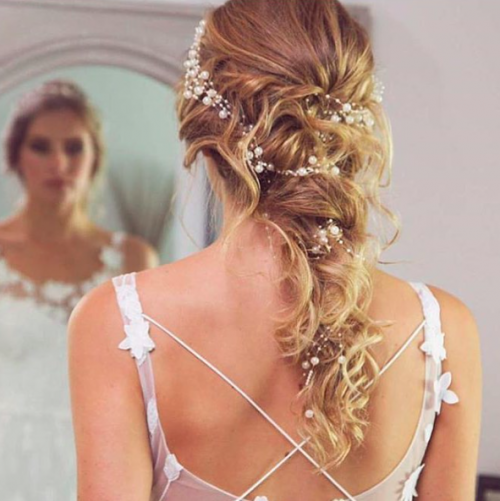 Wear your hair up, but not up at all, with this long, loose and lovely look, perfect for the bride with the longest of locks. When you’ve got wonderfully long hair, why would you want to hide it and pile it all up? This look gives you a way to wear it back, but not up, showing it off at the same time. 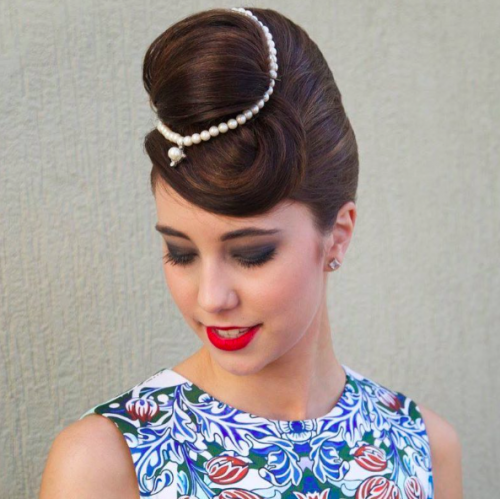 Add a vintage feel with this piled-high, sleek and pin-curl style do. The addition of jewelry really helps to make this look pop, although it doesn’t really need it. Still, everyone likes to sparkle, right? 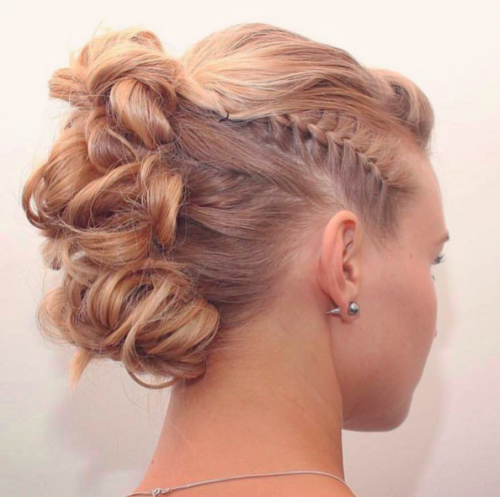 It’s a simple updo given a new lease of life with some wrapped braids. Pulled-apart fishtail braids to be exact. It’s the easiest way to add a new braid to your look and doesn’t take too long in the morning either. 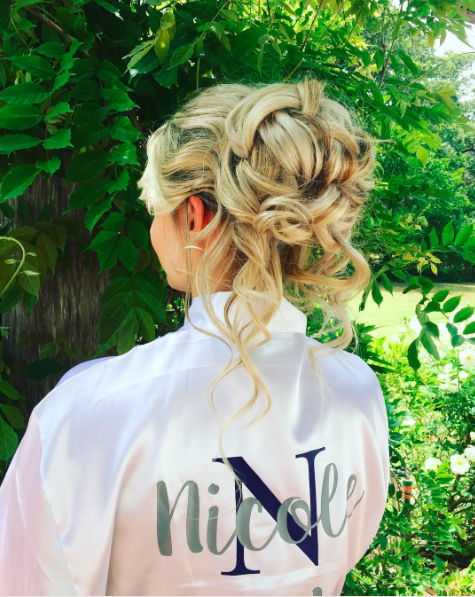 This pinned back look is so simple, and what makes it even better than that is the fact that you can add it to hair that was curly yesterday and has dropped out a lot today. Add a teeny-tiny braid to liven things up and you’ve got a look that gets you from 0 to 10 in no time at all. Spiral your hair with a small-barreled curling iron and then pile it all up on the top of your head for a look so cool, it wouldn’t look out of place on the pop star, Rihanna. It’s definitely elegant, but it has a modern and funky edge. You don’t need to keep your updos for long hair sleek and chic. I think we’ve pretty much established that, but we just wanted an excuse to show you this adorable, blonde bombshell look. This is right up there in terms of hairstyles we’d like to wear to the next wedding we go to. I love number five! and four. number three isn’t so good tho. Thank you for sharing your positive comment. We always appreciate feedback on our articles. Please feel free to share more of your thoughts and feelings. Have a great day, Luna!